For some time I have wanted to share some of the sights that I see on my antique picking adventures! As well as explain what is required to supply antique auctions with fresh farm primitives. Without giving away all my antique picking secrets I plan to highlight some of the onsite auctions that I attend in the Midwest. Over the years I have bought antiques in the Northern United States from New Jersey to Wisconsin. However with today's high fuel costs I pretty much limit my picking to Indiana, Michigan and Ohio. In years past when picking elegant antique furniture I focused much of my attention on the larger cities. However now that I am featuring a large selection of farm primitives at my Flowery Branch, Georgia antique auctions. I search for unpicked farmsteads in the rural areas of the Midwestern US. Regardless of how easy antique picking is made to appear on cable TV. 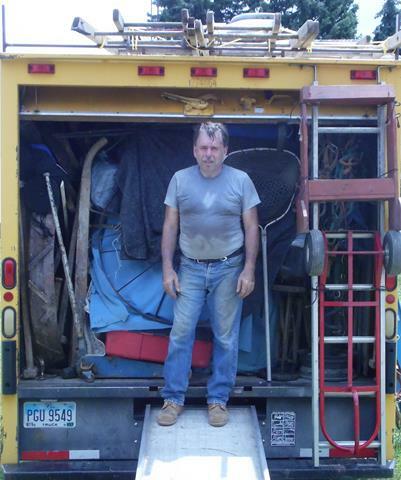 Supplying an antique auction requires lots of hard work and traveling many thousands of miles a year. Hours of research can go into finding unpicked farmstead auctions for one of my picking trips. In years past this required subscribing to many different newspapers. Luckily today much of this preliminary research can be done online. Though just because an auction listing looks good online doesn't mean that anything can be bought once I arrive! Fortunately having attended thousands of auctions over the years I have a pretty good sense of what to look for when selecting an auction to attend. I like to arrive at the onsite auctions I attend up to three hours early. Generally this early arrival allows for obtaining a prime parking spot. Parking close to the auction site can often be very helpful as purchases can be loaded though out the day. When attending an onsite auction once the auctioneer says sold the buyer is responsible for all their purchases. As such I like to at least make a pile next to my box truck if time doesn't allow for loading while the auction is in progress. Because it is very easy to miss something that is being sold especially if more than one auctioneer is selling at the same time. Quite often I have to settle for finding a vacant spot in the barnyard to leave my purchases until they can be loaded after the auction. Unlike gallery type auctions there is very little in the way of comfort at Midwestern onsite auctions! About the best you can expect is a lunch wagon, porta john and in the summer hopefully a shade tree. Midwestern onsite auctions are held year around with some of the larger crowds attending on bad weather days! Be prepared to stand all day in rain, freezing cold or 90+ temperatures if you are serious about buying at these auctions. Over the years I have seen very few Midwestern onsite auctions canceled because of bad weather! Bidding competition for certain antique items can be quite fierce at times! With many of the antique dealers in attendance arriving with trailers in tow and of course no one wants to go home empty handed. Smaller antiques that can be sold on Ebay generally have quite a few eager bidders driving up the price. However many years ago a friend told me that there is a bargain at every auction. Which is the key to many of my auction purchases. I arrive early so I can inspect everything, know what I am looking for and have the patience to outwait most of the auction crowd. Midwestern onsite farmstead auctions often start around 10AM and last until late into the afternoon. With a few larger farmstead auctions lasting until almost dark. Which makes for a very long and tiring day as loading the truck may require a couple additional hours. If possible I try to find onsite auctions to attend on consecutive days to minimize my travel expense. Generally I unload the first of my purchases into storage. With the goal of filling every nook and cranny as I reload my box truck for the 600 mile trip to Metro Atlanta as pictured above.